How on earth is it May already!? I can’t believe how quickly this year is flying by! Seeing the 1st May 2016 on my phone screen this morning took me by surprise, and reminded me that I need to review my bucket list for April, and write my bucket list for May. Decide on what I want to do when I return to work – Done, phew! It is such a relief to have sorted this out. I have decided to go back full-time working 4 days a week in the office and 1 day a week at home. I’ll have to see how the day working at home goes, as I will have the little one with me. Hopefully the baby jail (I mean play pen) that we are currently making in our kitchen will keep her entertained for a few hours. Introduce fish into our little one’s diet – I failed at this, the cod fillets are still in the freezer waiting to be made into a fish pie. One for next month. Defrost the freezer – Tick, achieved. I’m so glad that this is done, it was quite satisfying hacking away at the melting ice. I now have a nice neat freezer, where the draws can close properly, and our fridge is working so much better as a result. Blog – I had on my list for April to reach 2,000 followers on Twitter, complete the 30 Day Blogging Challenge, and grow traffic to my blog. It has been a very busy blogging month – not quite getting to 2,000 followers, but 1,957 is close enough. Co-hosting #KCACOLS and setting up my own Linky #fortheloveofBLOG with Fi from A Mum Track Mind, has really helped increase traffic to my blog. Yesterday I got a record high of 397 views in one day! The 30 Day Blogging Challenge has taken a back-seat, as reading and commenting on blog posts has kept me very busy, we also had a week’s holiday where I didn’t really do much blogging. Admin -The admin pile for our little one has not been sorted, but a box to store all her paperwork in has been purchased. Read one book – Since having our daughter I have barely done any reading. I really enjoy reading so I have set myself a task to read one book this month. This means that I also need to finish reading the book I’m currently reading. Investigate self-hosting – Now that my blog is growing, and I’m co-hosting a Linky I think I really ought to go self-hosted instead of relying on the free WordPress platform which is brilliant but also has its share of challenges. I’m not going to task myself to have self-hosting complete this month, but I would like to have a plan in place and know exactly what needs doing. Ideally I will have my site self-hosted by the time I go back to work, otherwise it’ll never get sorted. Fish – Use the cod fillets in the freezer to make a fish pie to introduce fish into our little one’s diet. Enjoy London – We live in London but we hardly use London, if you know what I mean. There are some amazing places right on our doorstep, however I always find that I spend all my time locally where we live. Now that I have the time to explore London in the week with our little one, I really should use it wisely before going back to work. I’ll let you know how I get on at the end of the month. Some of your blogging goals are the same as mine (well my numbers are a bit lower lol), I really am looking forward to expanding a bit. I will look at your linky as that may help me, thank you. Claire, I love lists and I think this is a great one. As a relatively new blogger I know how steep the learning curve can be with going self-hosted. I got lots of information from the viperchill website and also from picking up a lot of ebooks from amazon from free to £2. There is so much more flexibility with self-hosting. Go for it! 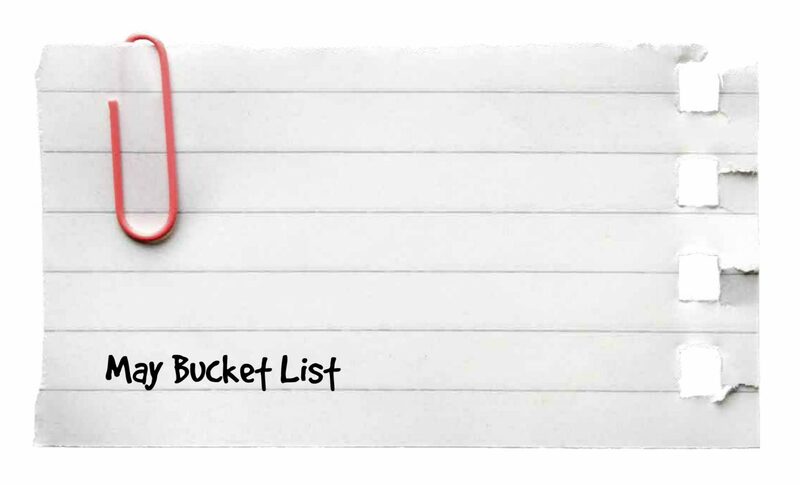 I love the idea of a Monthly Bucket List. Maybe if I did this I would get more accomplished. Good luck with going back to work full time. It has been a challenge for me in the last year. Especially with trying to juggle everything lately. I love the idea of the Linky and am hoping to figure it out so I can try it out. Looking forward to hearing how everything goes in the month of May!